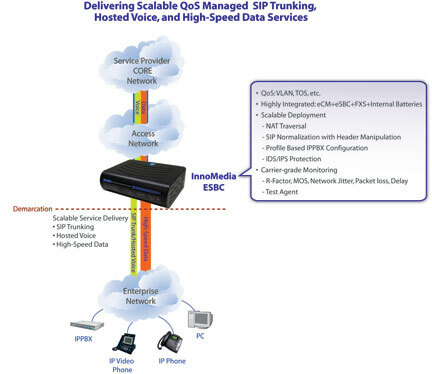 Designed for Service Providers offering SIP trunking, hosted voice, and high-speed data services, InnoMedia’s ESBC 8328-4B is a highly integrated and highly manageable Enterprise Session Border Controller (ESBC) that can be auto-provisioned and remotely managed. 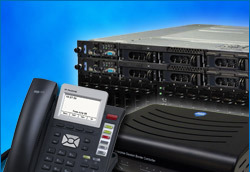 It is ideally suitable for wide deployment by broadband service providers addressing SIP-PBX interoperability for SIP Trunking as well as providing simple NAT Traversal for Hosted PBX Services. A stateful inspection with IDS/IPS is placed in front of the FXS ports, the SIP trunk traffic path, as well as the non-SIP Trunk SIP traffic path to protect these paths from unauthorized access or attacks. The high-speed data path is not protected by the firewall as it is assumed that this path is connected to the enterprise firewall which has its protection policy. The SIP trunk path provides SIP normalization, NAT traversal, topology hiding, and security for Service Providers offering SIP trunking service to enterprise customers with diverse IPPBX and network configurations. It includes B2BUA for SIP normalization, a Registrar for User Agent (UA) registration, TLS block for secured signaling, and NAT traversal for proper SDP address correction. The UA (e.g., IPPBX) registers to and communicates with the ESBC which terminates UA traffic and re-initiates normalized SIP packets to communicate with the Service Provider’s network servers. The SIP ALG path enables Service Providers to offer Hosted PBX Services with NAT traversal, TLS security for signaling, and header manipulation. It allows SIP packets of registered UAs (e.g., IP Phones) to traverse through to communicate with the network servers. The UAs register to the designated network servers, and point to the ESBC as the default gateway. 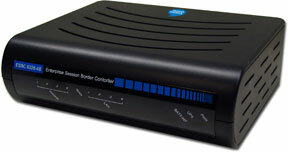 The bridge path is a transparent pass-through port, allowing undisrupted high-speed data to go through. It is intended for Service Providers to offer high-speed data services. The ESBC 8328-4B, located at the edge of the HFC access networks, can be managed by the Service Provider with secured HTTP-based auto-provisioning and SNMP-based remote management. It offers an ideal demarcation between the Service Provider and its enterprise customers.